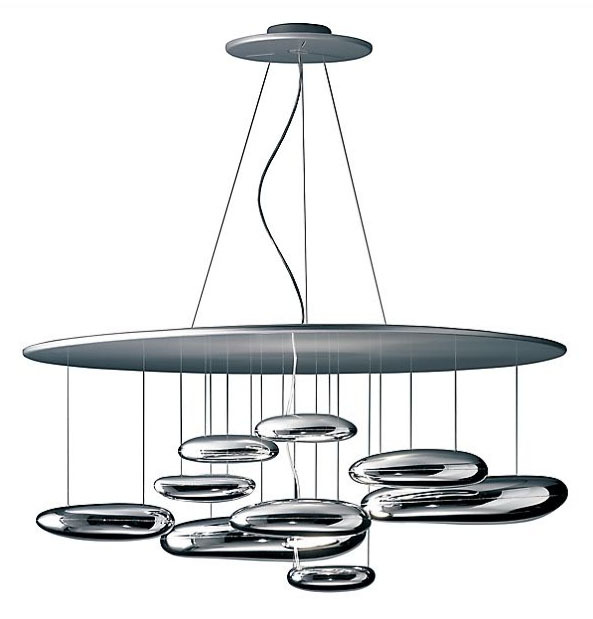 This contemporary ceiling suspension light, designed by Ross Lovegrove, places a floating assembly of large pebbles with polished chrome finish below a aluminum disc. The chrome pebbles reflect each other, bouncing light between their surfaces and the surrounding environment. There are two halogen lamps that sit atop the two lowest pebbles, reflecting light up to the aluminum disc. The Artemide Mercury Ceiling Suspension creates optimum lighting precision using minimum energy resources.